—Cheryl Strayed, author of Wild. “Freeman’s second novel is an achingly gorgeous heartbreaker. We know it will be all along, as an old-fashioned omniscient narrator warns of bad news — and when it comes, it is very bad — and yet we cannot stop reading.” Full review here. “Freeman’s follow-up to A Disobedient Girl is a more ambitious affair but one she pulls off triumphantly…Freeman excels with two characters who are so good they seem to belong to a literary tradition: overweening Mrs. Herath, who sets store by “civilized behavior” and has enthusiasm for the “rehabilitation” of the Bolling girls, is a reincarnated Jean Brodie; and hapless, “half-mad” Raju with his face like “a just-ripening jackfruit that had fallen too fast and too long onto the ground” is straight out of Dickens…On this one street we can find life in all its joy and pain, life lived by people who are so alive.” Full review here. “Freeman is a Sri Lankan native now living in Philadelphia, but there is something positively Russian in the feel of this book…For 300 pages, nothing much happens, and it happens beautifully.” Full review here. “Set in the early 1980s, On Sal Mal Lane is partially a history lesson in which Freeman even-handedly examines the racial, political and cultural tensions of a divided Sri Lanka through the eyes of ordinary people. But at its heart the novel is more universal in its appeal, a lyrical meditation on childhood and family, on fear and innocence, loyalty and fate.” Full review here. “(Freeman) dares to let her narrative unfold slowly, very slowly, balancing a fondness for foreshadowing — we’re never allowed to forget the coming sectarian conflict and its tragic consequences — with remarkable patience. 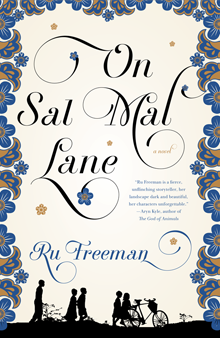 By the time Freeman’s characters are finally tested, some found wanting, some proving to be caring neighbours after all, the reader is thoroughly invested in the fate of all the residents on Sal Mal Lane.” Full review here. “On Sal Mal Lane, to put it simply, is beautifully composed. It’s strung together by numerous vignettes that effectively shift from one character to another, which is not always easy to achieve especially with a book that boasts so many multifaceted personalities…(the book) is neither pro-Sinhala nor pro-Tamil. It accepts all of humanity, including its achievements and its shortcomings, with equal weight.” Full review here. “On Sal Mal Lane is an exquisite composition of the intimacy of everyday life juxtaposed against the larger world. Freeman captures the complexity of the internal struggles of youth in all its confusion and yearning with the greater forces of family and country, forces far beyond their control but that will shape them irrevocably.” Full review here. —Catherine Gilmore, for The Gilmore Guide to Books.